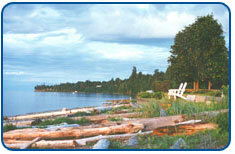 The beaches along Lantzville’s 4.5 km long waterfront are always changing. The formation of beaches is result of dynamic process of “erosion” and “deposition” caused by tides, waves and longshore currents. Lantzville’s beaches are primarily cobble and narrow, because they are in an erosion area. The community has done an excellent job of developing a number of useful and attractive neighbourhood parks including Copley, Huddlestone and Rotary Parks. These parks provide an opportunity for visitors and residents to enjoy the surroundings of this community. Parks are located in both Upper and Lower Lantzville. Huddlestone Park is available for private functions and may be reserved by calling the District of Lantzville Municipal Hall at 250.390.4006. Booking of the facility is free of charge; however, the Municipal Hall accepts donations with monies being put towards improvements to the Park. The District of Lantzville has a Partnership Agreement with the Province for the District to maintain, within a 10 metre right of way, the 8.6 km Copley Ridge Recreation Trail (also known as the Copley Woodlot Trail) for non-motorized public recreation within the productive working forest (Woodlot Licence W1475).